I recently took a course in circuit analysis where we learned the maximum power transfer theorem. 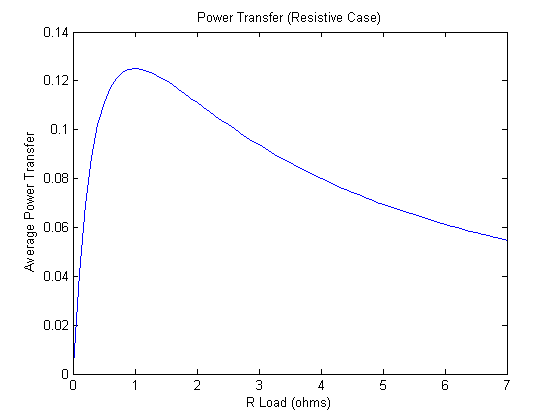 While there are many plots of the power transfer in the purely resistive case, I did not see any for the case where the source and loads are impedances (with both resistance and reactance). 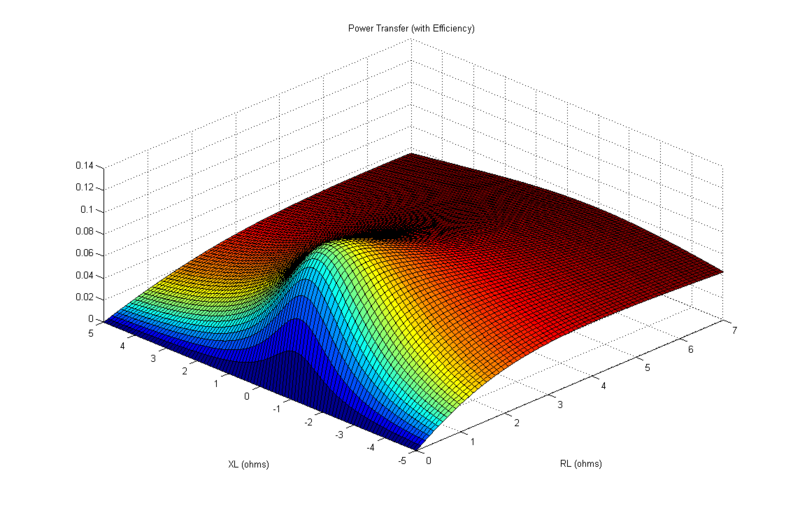 I played around with 3D plots to get a better understanding of power transfer and to practice using Matlab. Here is a write-up of what I did. Image: “Source and load circuit Z“. Licensed under CC BY-SA 3.0 via Wikimedia Commons. is the voltage source, which we assume to be a steady-state sinusoidal source. is the source or internal impedance (with resistance and reactance ). is the load impedance (with resistance and reactance ). The idea is to find the amount of power transferred to the load by the voltage source given a fixed source impedance. 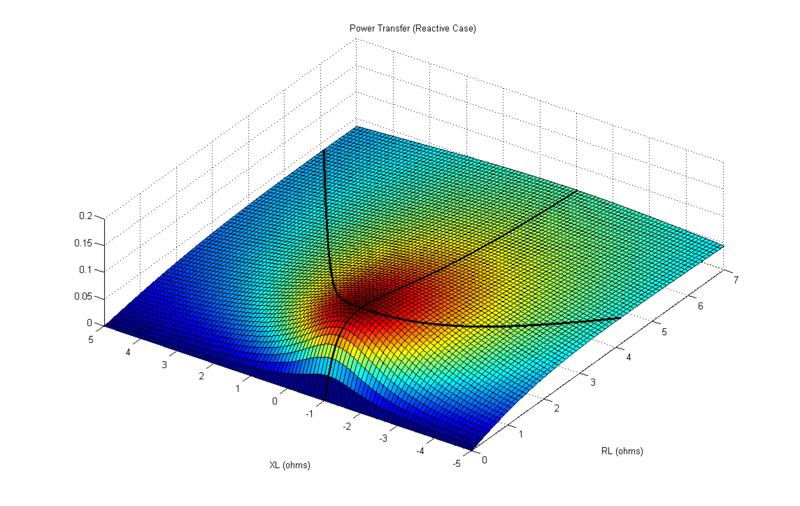 We are particularly interested in finding the load impedance that will give us the maximum power transfer to the load. There are many references that discuss these concepts, so I will not go into more detail here. 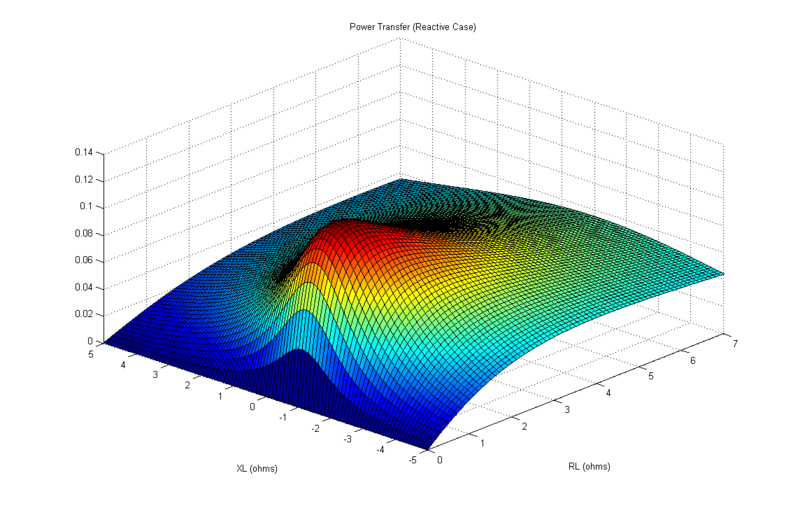 I will note however that there is an interesting article “Non-Calculus Derivation of the Maximum Power Transfer Theorem” by Dr. Kenneth V. Cartwright which discusses the theory in a non-traditional manner. I will show the equations, but will not derive them – I will use the same notation and form as found in the “Maximum power transfer theorem” Wikipedia article. I will include short Matlab code blocks throughout this document. These are meant to be run in order (in other words, each code snippet will depend on variables or plots from previous snippets). I am no Matlab expert, so I am sure there are better ways to write and present the code. For variables, I use the following convention: scalar constants are designated with lower case letters, whereas vectors and matrices are designated with upper case letters. For simplicity, I use the value 1 for all constants. To get the most detail from the plots I include, you will need to click on the images. As before the maximum power is . Note that the numbers along the vertical axis of the graph still indicate power magnitude – efficiency is only indicated by color. As expected, the efficiency increases asymptotically to 100% as load resistance increases (dark blue indicates 0% and dark red indicates close to 100%).